Newsmax's Franklin Prosperity Report is a monthly financial newsletter that is chock full of money-making and money-saving ideas. Every month, the editors of the Franklin Prosperity Report scour information from the world's best experts to tell you how you can save today so that you can increase your wealth tomorrow. Whether it is best-kept secrets by the country’s wealthiest individuals, common mistakes people make that keep them from wealth and prosperity or tips on how to discover the path to true wealth, the Franklin Prosperity Report brings crucial financial lessons to your home every month. The type of financial advice you receive in the Franklin Prosperity Report would cost you thousands of dollars a year that you would have to pay financial advisers, tax accountants, and attorneys. 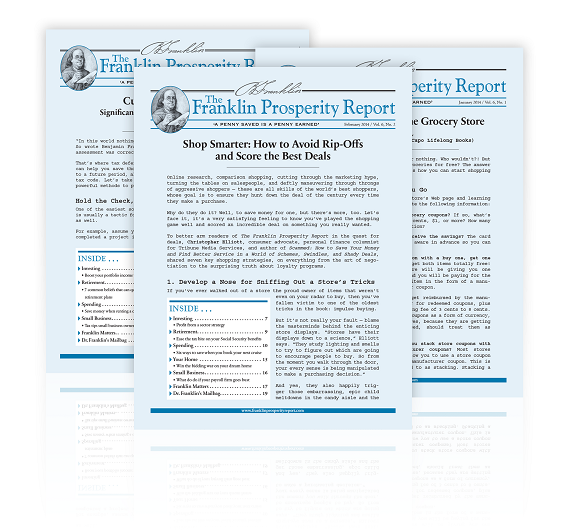 Instead, with just a minimal investment, the Franklin Prosperity Report hands over the secrets of the wealthy to you every single month AND offers you the kind of invaluable advice that will ultimately SAVE you thousands of dollars in the long run. Copyright © The Franklin Prosperity Report, All Rights Reserved.